It didn’t take long to pass the new labor law in France once it came back to the National Assembly from the Senate. As soon as the July 5 session started to consider the bill, Prime Minister Manuel Valls took the floor and declared it passed, using some wrinkles in the French Constitution that allow the government to avoid a vote. Valls expected to lose a vote on the bill itself, but the majority that would have rejected the new labor law didn’t have enough votes to block his move. The law is set to be fully implemented in August, when some enabling regulations are adopted. The coalition of unions leading the opposition to this law, which has organized 11 national demonstrations and one-day strikes since March, had another day of protest on July 5 to mark passage of the law and call for its repeal. The cops did everything in their power to limit participation in the Paris march, from doing body searches of retirees three times to exercising police powers under the current state of emergency to keep named individuals from participating. 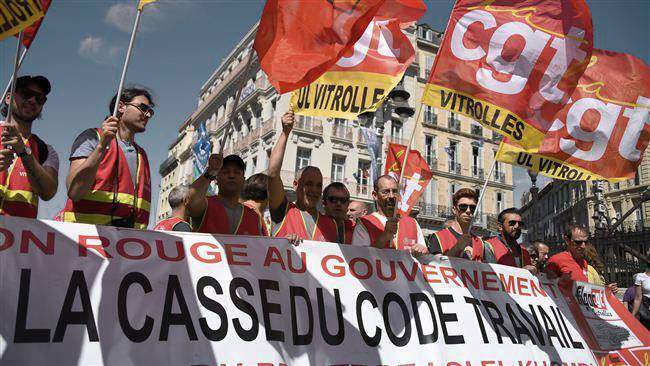 Still, according to the CGT, the biggest labor confederation, 45,000 protesters came out in Paris and about 100,000 nationwide. The so-called Socialist Party (PS), which is currently running the French state for the French bourgeoisie, has lost popular support. Polls show that its favorable ratings are in the low teens. The PS claimed it was calling off its summer mass meeting because of the threat of violence, but most French militants said the real reason was that nobody wanted to come. Someone, probably angry workers, replaced the “Parti Socialiste” signs on 30 of the PS’s local offices with “Pourris Salauds” (rotten pigs) during the night. The workers of France, who are determined to enjoy their hard-earned vacations won by historic struggles, are equally determined to come back stronger to struggle in the fall. They intend to defeat the austerity that aims to make them work more to earn less, and to reject the job insecurity that their bourgeoisie and its European class allies — who are also competitors — intend to put on their backs.